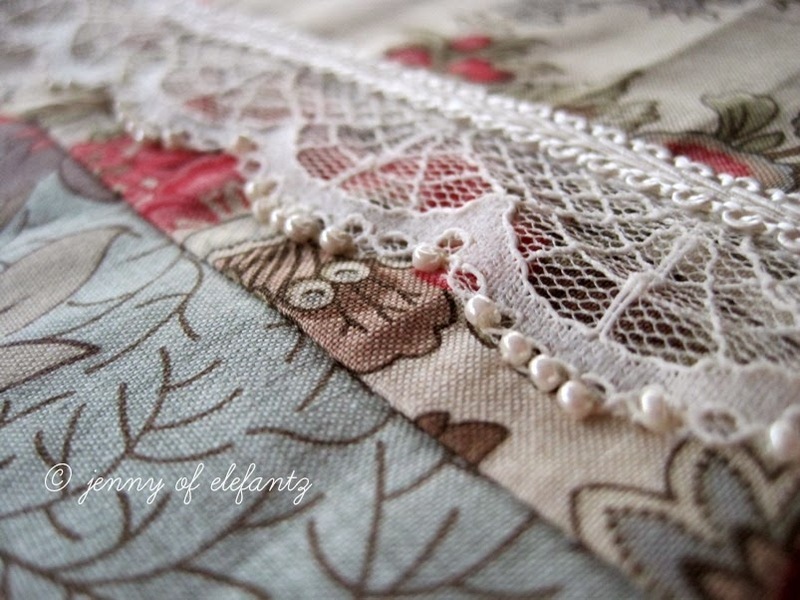 For a number of years I would often create special gifts for family and friends from bits and pieces of fabric, lace, ribbon, beads, buttons, old brooches and other pretty things. They were gifts which employed a touch of creativity but really weren't as difficult to make as they looked. 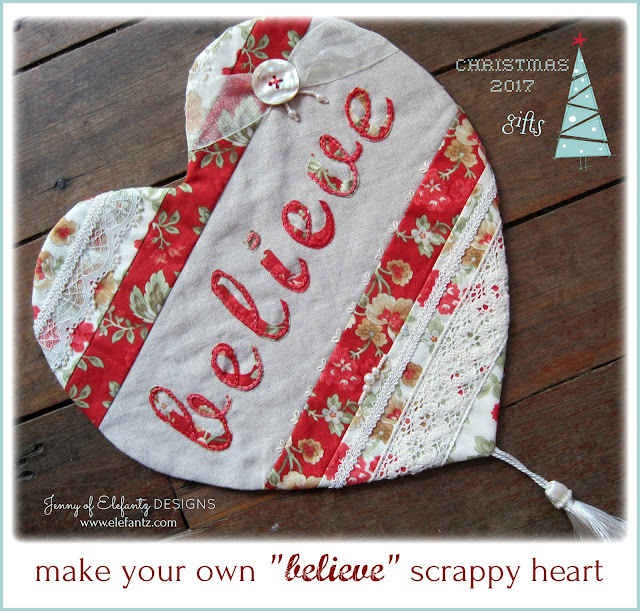 One of those gifts was a "Believe" heart and I wondered if you'd like to make it as a Christmas gift for someone who may need a little 'believe' reminder of their own? 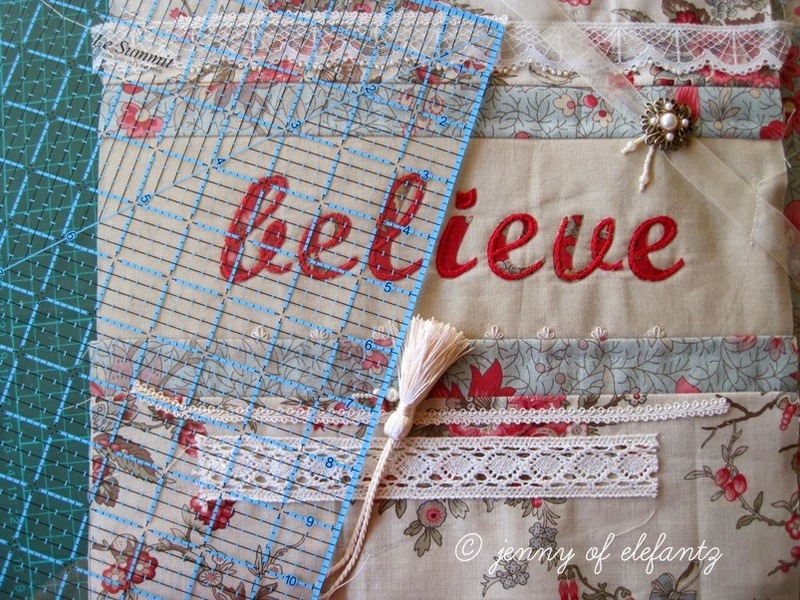 I first shared this tutorial about four years ago but as it's such a pretty project it seemed a good idea to offer it once more. 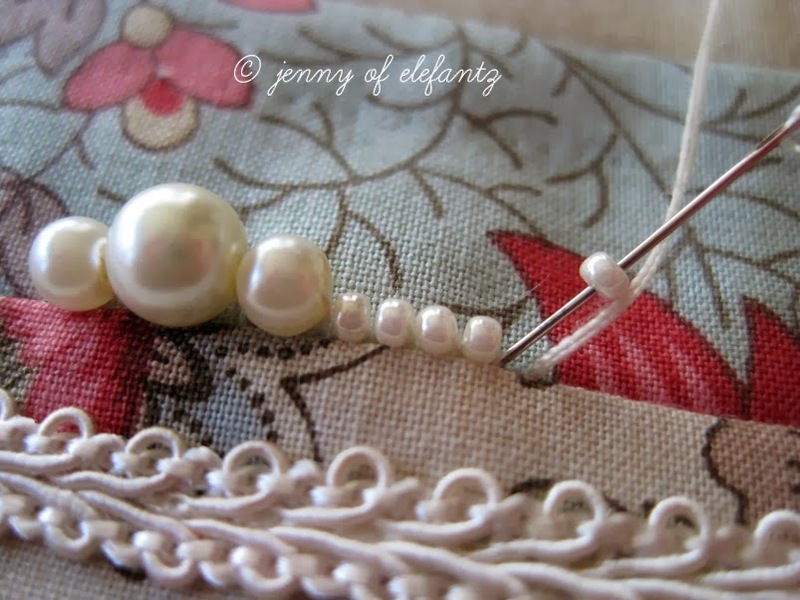 Gather your favourite scraps of fabric, aged lace, glass and pearl beads, old brooches or even broken vintage earrings, a tassel, embroidery thread and a piece of leftover quilt wadding or fusible Pellon. I'll walk you through it step by step, ok? Download the free heart and wording templates here in my shop. Trace the reverse wording onto the smooth side of your Vliesofix. Fuse the rough side of the Vliesofix to the back of your 3 x 9 inch strip red background floral fabric. Cut out all the letters along the traced lines. Place the 4½ x 12 inch strip of a solid beige fabric in front of you and make a pencil mark along the bottom raw edge, 2 inches in from each end. 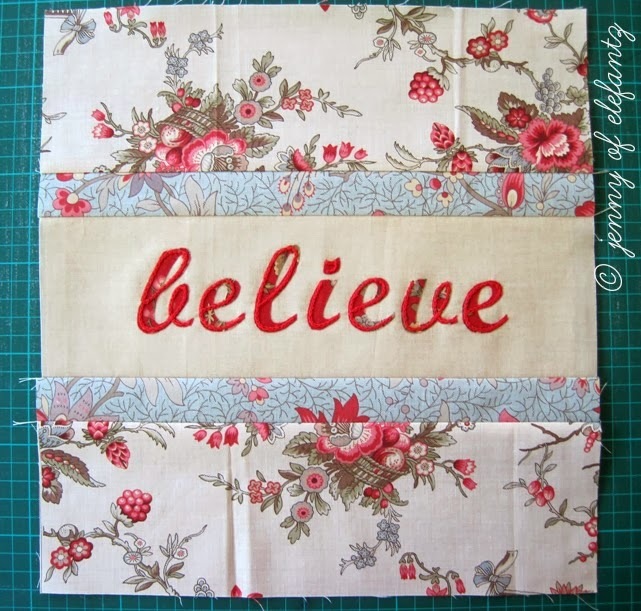 Peel the Vliesofix off each letter, and fuse the word ‘believe’ along the middle of the beige fabric, in the 8” space between the two pencil marks. 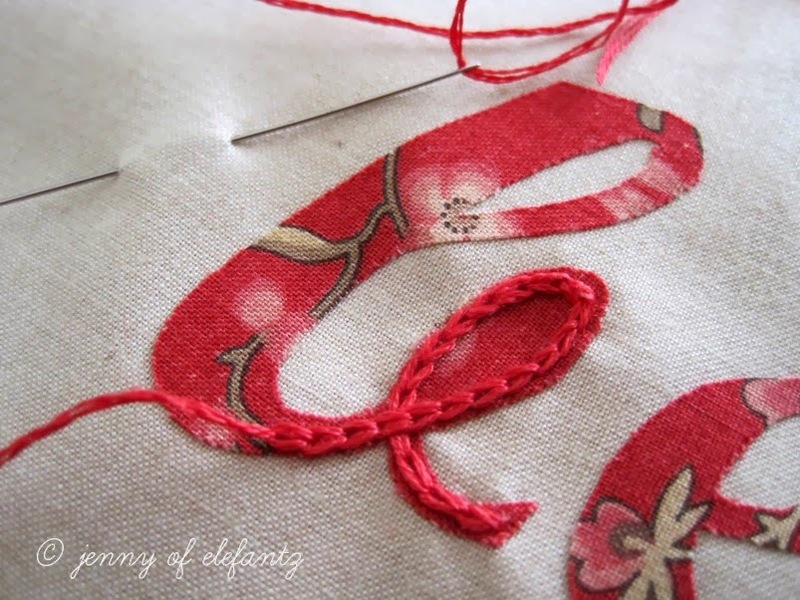 Using 3 strands of the red (347) thread, chainstitch through each of the letters. Trim the block to 4 x 12 inches. Sew a 1½ x 12” strip of blue background floral print to the top and bottom of the appliquéd block. Sew a 3 x 12 inch strip of cream background floral print to the top and bottom. Fuse the quilt wadding (or Pellon) to the back of the block. Place the scalloped cream nylon lace above the top blue fabric section, leaving ¼ inch between the bottom of the lace and the blue fabric. Machine stitch in place. Cut out the heart shape from the pattern sheet. Lay it across the block, remembering you want the wording to be on a slight angle. 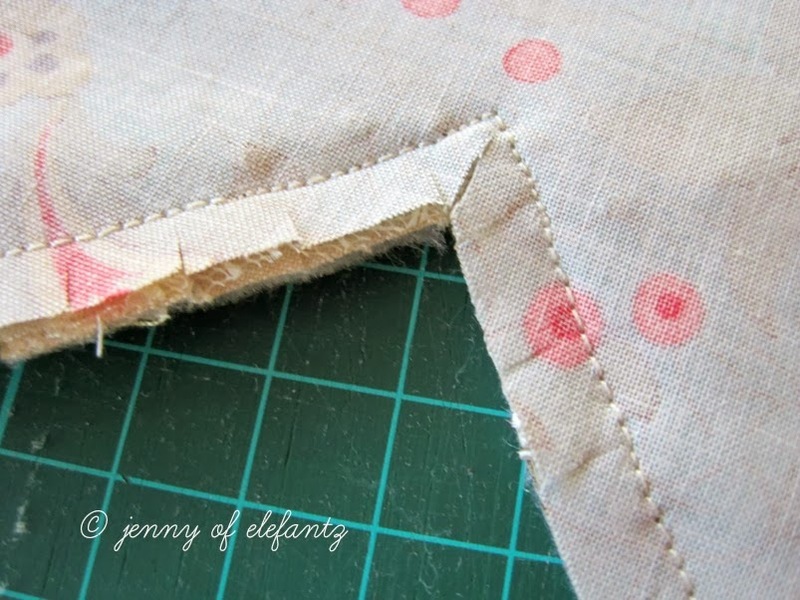 Draw a pencil line around the heart but do NOT cut your fabric yet. Cut the braid into two sections – a 6” and an 8” length. 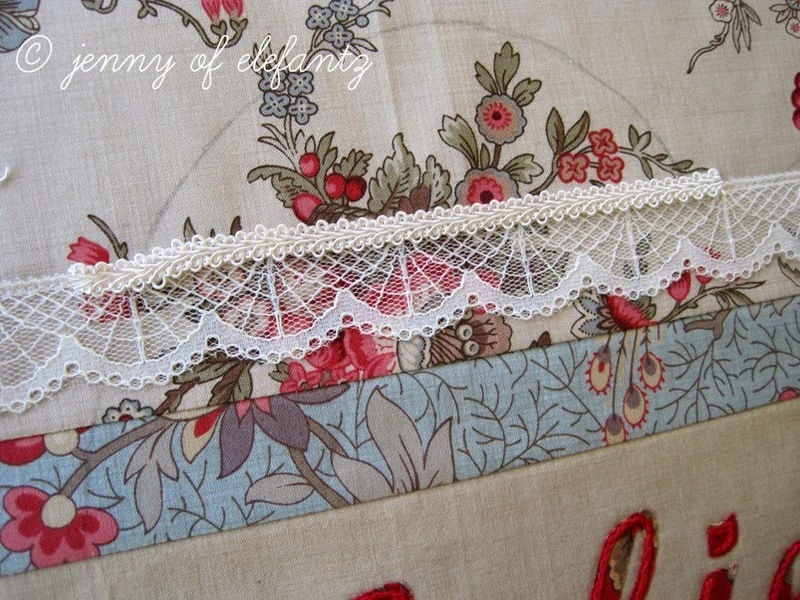 Stitch the braid in place along the top of the scalloped cream lace, and ¼ inch under the ditch between the bottom blue and cream floral sections. 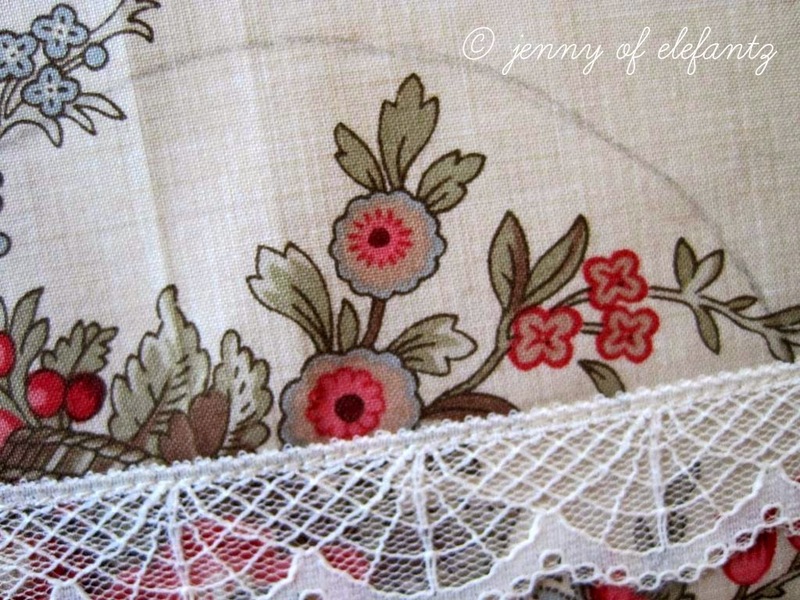 Sew the cotton lace ¼ inch under the braid at the bottom of the block. 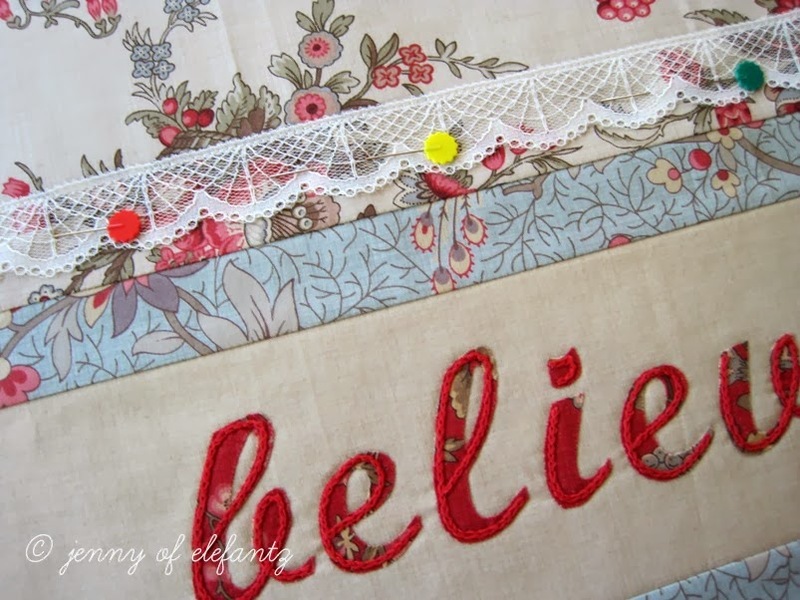 Using the Ecru thread and your pearl beads, backstitch them across the ditch between the blue floral strip and the beige wording panel. 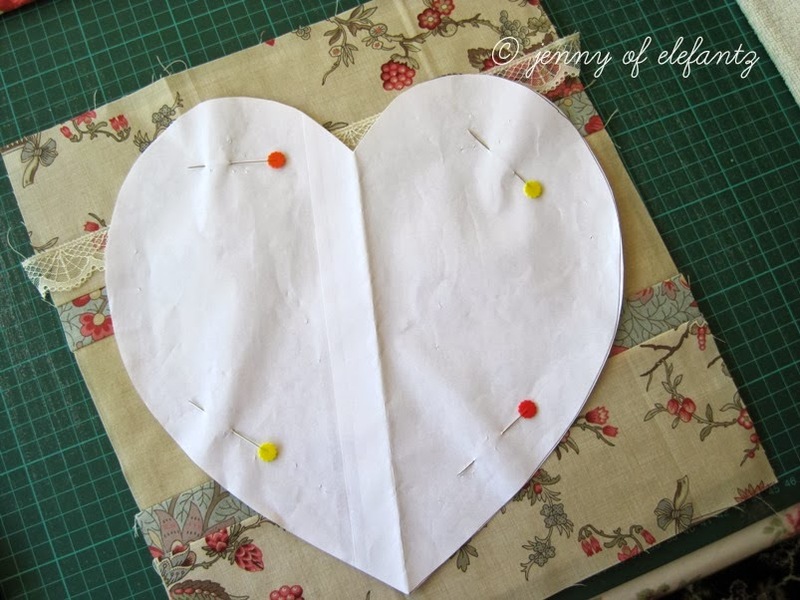 Lay the organza ribbon across the top right of the heart shape you’ve traced on the block, and sew down at each end, just inside the traced pencil line. 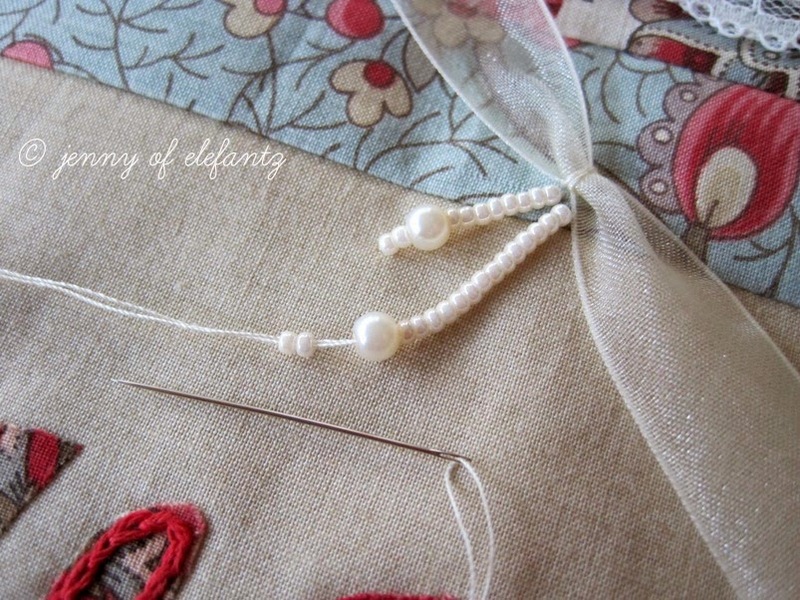 Make a gather in the middle of the ribbon by tying a thread around it and pulling through to the back before tying off. From just under the gathered section of the ribbon bring a double thread of Ecru through to the front and thread on 8 seed beads, a 4mm pearl bead, and 2 more seed beads. Pull the thread through to the back of the block and secure. Repeat this beading process, but this time with 14 seed beads, a 4mm pearl bead, and 2 more seed beads. 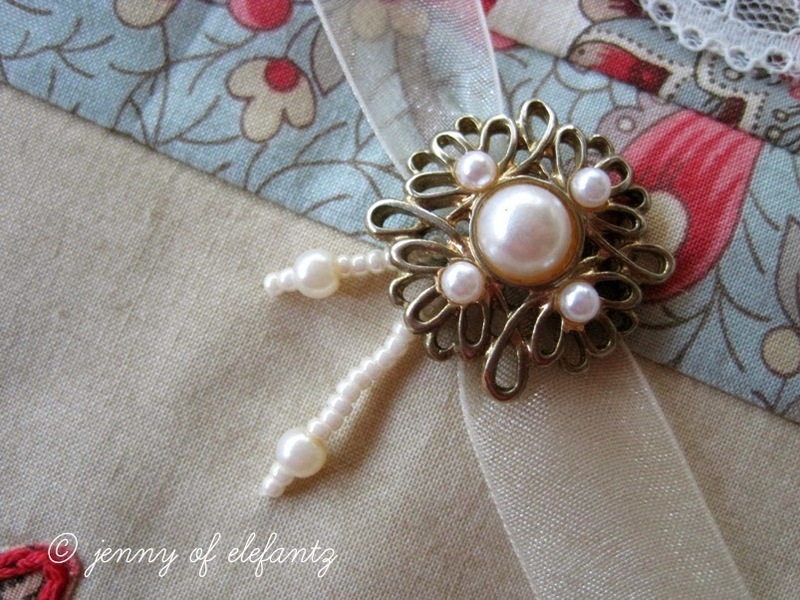 Sew a decorative button over the gather in the ribbon, or add a brooch or vintage earring as I have done. Backstitch seed beads across the scallop of the cream nylon lace. Make little bouquets of lazy daisies in the ditch between the worded block and the blue floral strip. 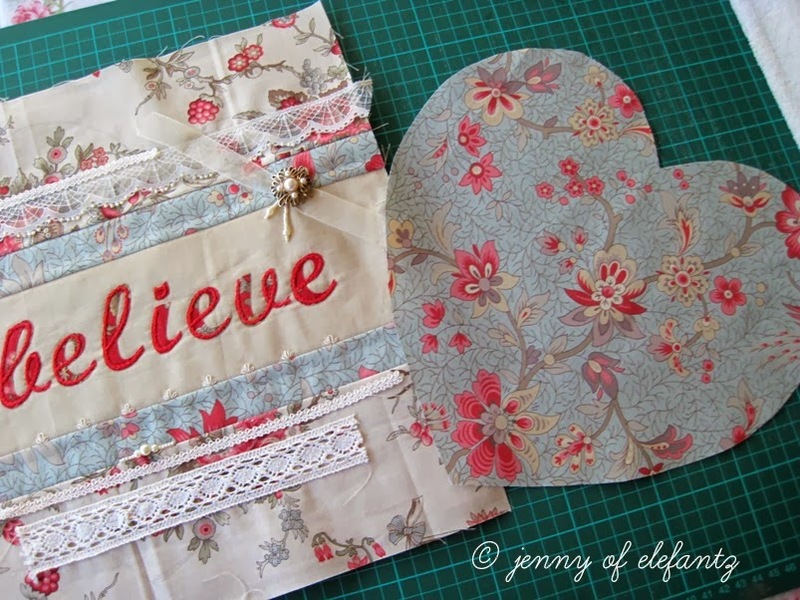 Use your heart template to cut out the backing heart. Place the tea-dyed tassel on the heart block in this manner. 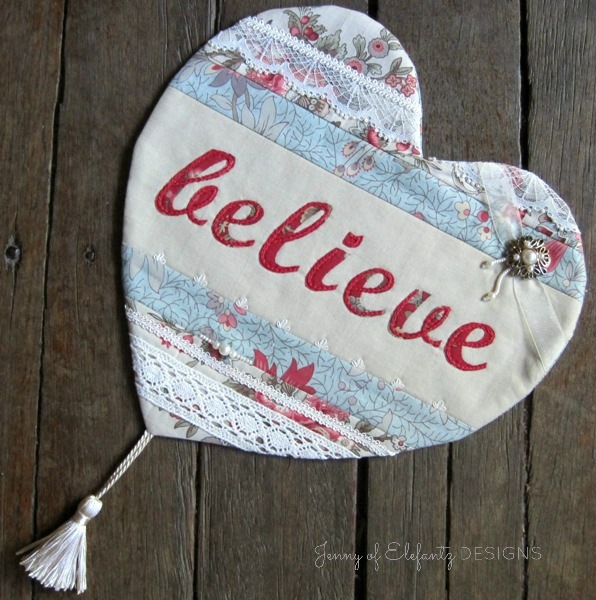 You need the tassel to be in line with the middle of the rounded heart peaks at the top of the block. Stitch in place with a scant 1/8th inch seam. 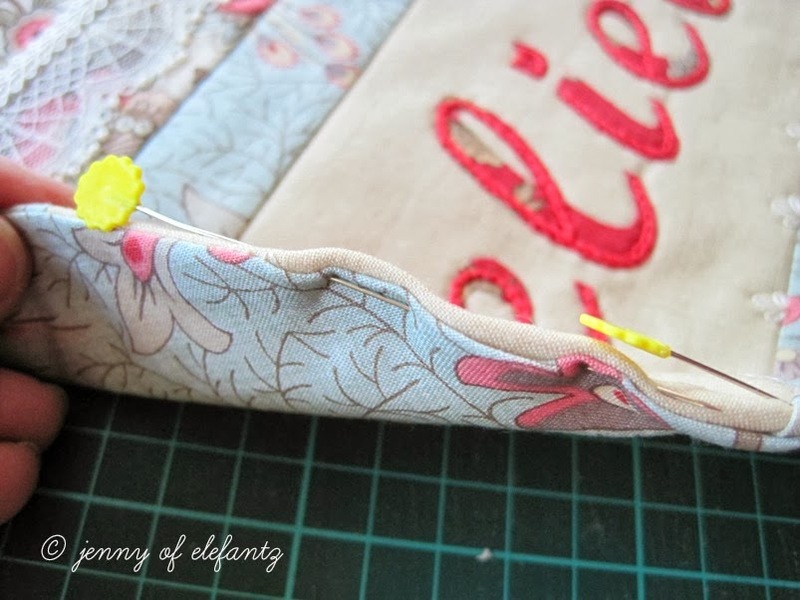 Sew the block and the backing together with a ¼ inch seam, leaving a 3 inch opening for turning out later. Cut around the completed heart shape, and clip the corners. Turn right side out, and use a rounded tool such as a large knitting needle to gently push out the edges. Ladder stitch the opening closed. I made two 'Believe' hearts, very alike, but also different. This would be a nice project for a craft group, don't you think? An afternoon sharing trims, fabrics, cake and tea - memories are made that way. And how lovely that everyone would go home with a heart. 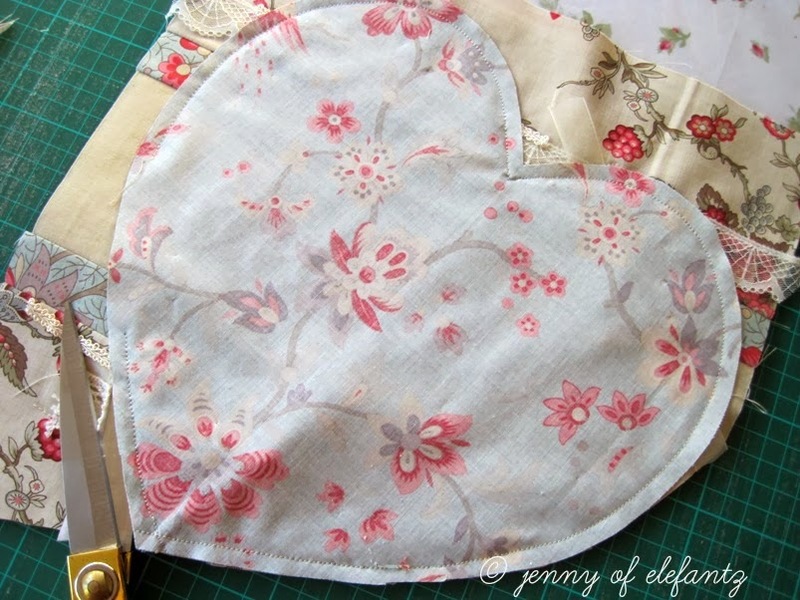 You could even organise a heart swap with sewing friends far away or what about making one for your own sweet self? 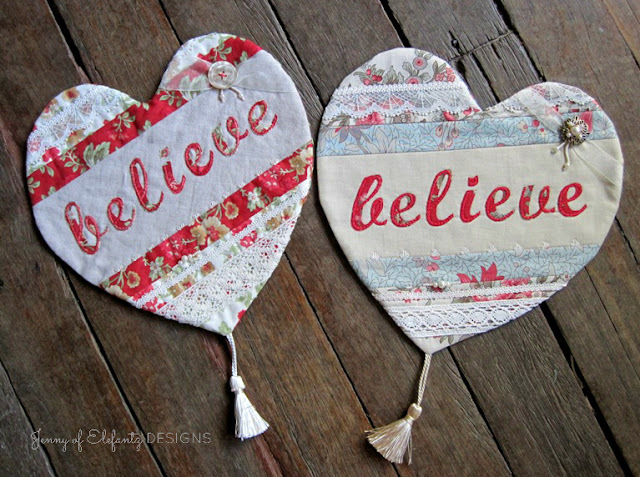 However you make your 'Believe' heart, be sure to enjoy the process. 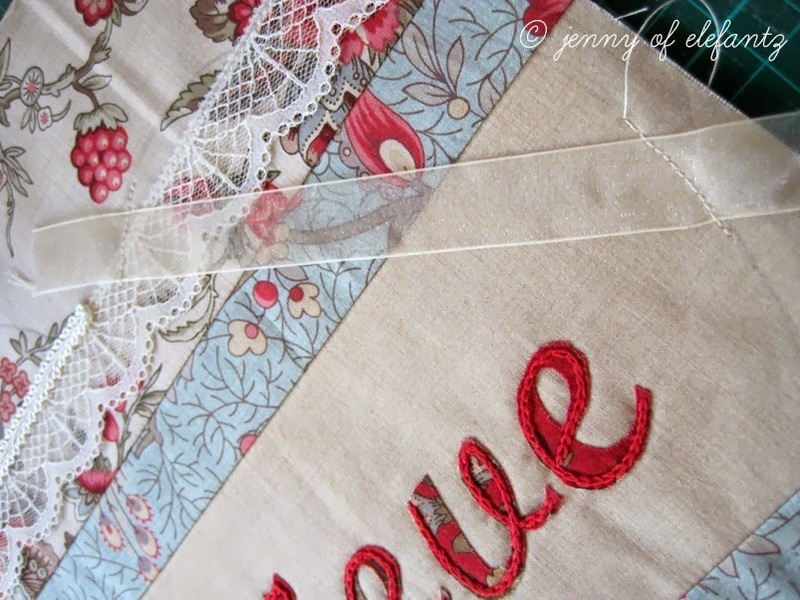 Let your creativity come out to play and don't be afraid to finally snip off a length of your treasured vintage lace or cut into that piece of fabric you've been holding back for a special purpose. Go forth and make something beautiful. Looking for new embroidery designs? Visit The Stitchery Club HERE! Jenny, this is so beautiful, thank you very much for the tutorial. I am going to attempt to make one (or more if successful) of these. Thanks, Jenny. It's a wonderful idea, for any gift-giving or encouragement one might want to do for a friend. I might even have some floral fabric around here somewhere. This was a good Monday idea and project. Hearts are my favorite shape! Love your embellishments. Thanks for the tutorial. Absolutely beautiful! 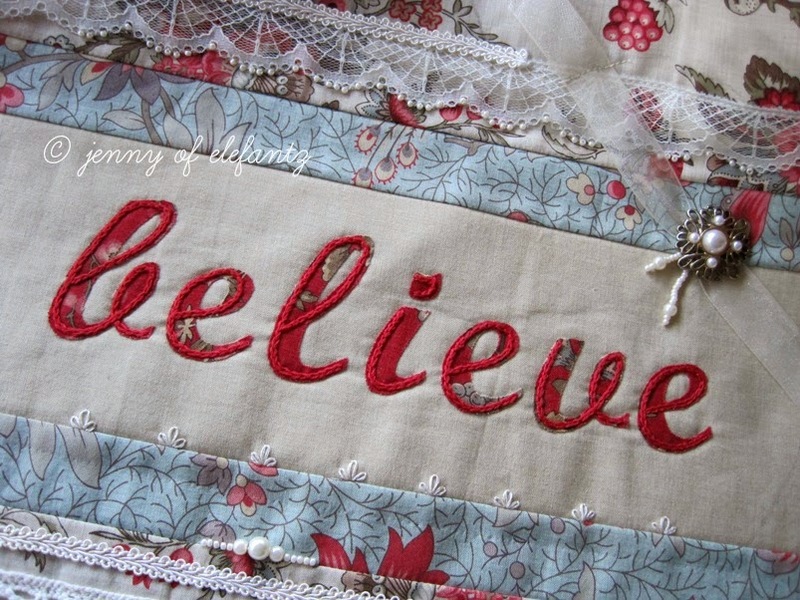 I love how you have added chain stitch on top of the letters. So unique. Your ideas are endless. Thank you Jenny! Your projects are always so beautiful. And a real bonus when you include the pattern and a tutorial! Ha! I went to JoAnn's yesterday on the way to an appointment, and I found the perfect jewelish thing to put on these! I've had them on my mind since you posted this. =) It had four jewel things on it, and I had a 40% off coupon, so it was about $1 each to use with the scraps I already have. I also found larger pearl beads for $1/strand, and so I'm happy dancing because for about $2 and a bunch of scraps, I can make some nifty things for my friends! I still have mine that you gave away on a blog post a few years ago! That word will always be special to me! Thank you again!